Update March 26, 2018 at 1:45 pm – sketch added to post. 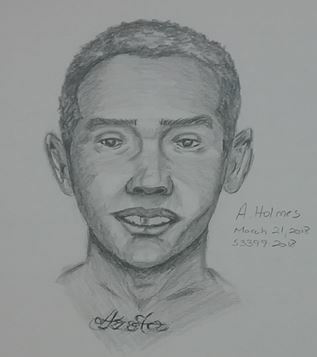 On Tuesday, March 13, 2018, at approximately 3:47 p.m., in the 2800 block of Clydedale Drive, a female was inside of her apartment residence when an unknown male entered and attempted to assault her. The female was able to prevent the attack and the male fled from the apartment southbound on foot from the 2800 block of Clydedale Drive, Dallas, Texas. The male suspect is described as being a Black male, with a short hair cut that is black and gray in color. He is between the age of 35 to 40-years-old, 5’9” tall, and approximately 160 pounds in weight, and he has gold “grill” teeth. The Dallas Police Department is asking for the public’s assistance in identifying the suspect. Persons with information are asked to call Detective A. Barton #7441 at 214-671-3685. Citizens are being asked to be on alert and aware of their surroundings and to secure all points of entry into their residences. Citizens are asked to report any suspicious behavior in the vicinity. This offense was documented on case #053399-2018.